Thanks Greg Hoffman and good morning Mayors, ladies and gentlemen. I’m delighted to be here to give a short talk hopefully that provokes a bit of thought about the future of regional Queensland. 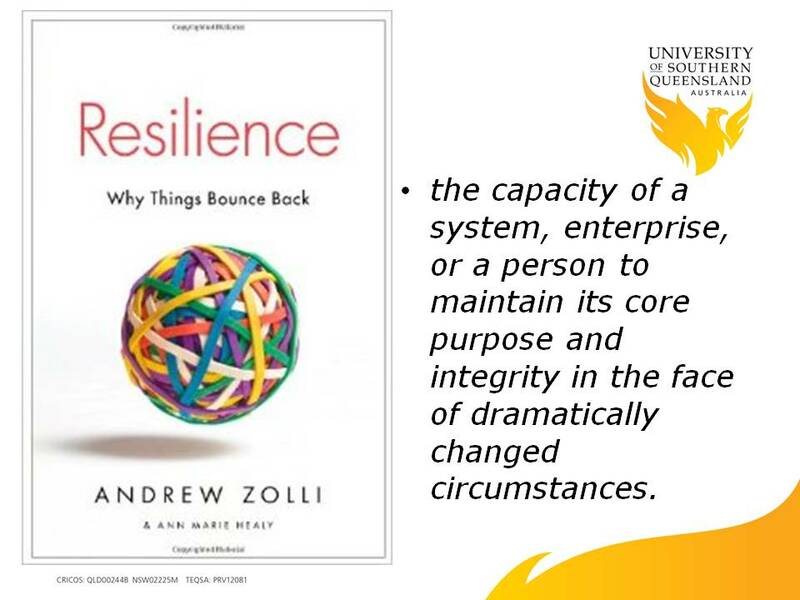 I’ve called my presentation “Making Regional Queensland a Resilient Proposition” and in the context of the themes that LGAQ Chair Cr Margaret DeWitt has already identified I think it’s timely that we talk a little bit more about building resilience. 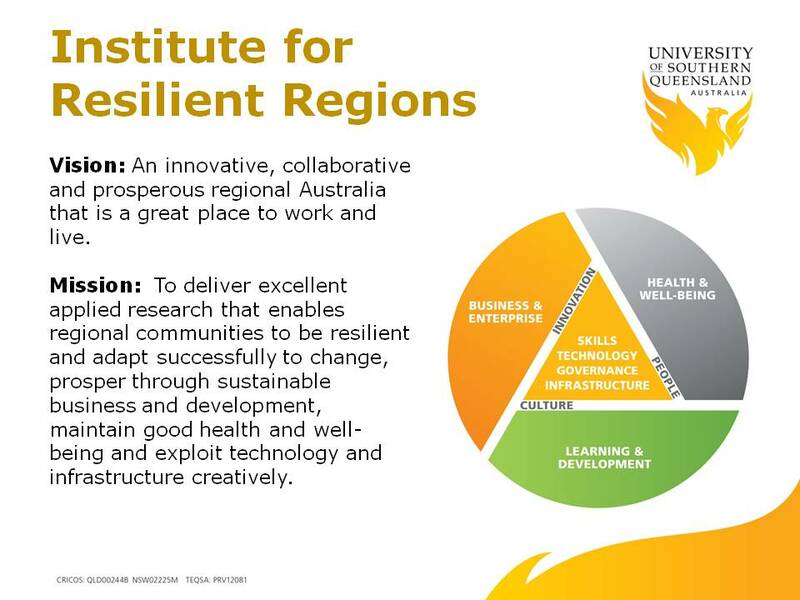 In fact the University of Southern Queensland has recently established a research institute dealing with the issues of regional Queensland, particularly with the aim of helping bush communities by working collaboratively to develop a vision of an innovative, collaborative and prosperous regional Australia that it’s a great place to work and live. We are doing that through research partnerships involving all kinds of people addressing key elements like small business, enterprise and entrepreneurship; the health and wellbeing of people and communities; enhancing the social dimensions of regional development and also importantly, in the context of today, accelerating learning and development and working with people like yourselves to build capacity and leadership in regional communities. For an old farm boy who grew up in the South Burnett back in the 1950s and 1960s you don’t have to tell me too much about what it is to live in regional Queensland and about the people who live here. Indeed Balonne Shire Council Mayor Cr Donna Stewart has done a great job in her welcoming remarks this morning reminding us of what it is that is special about regional communities. My association with local government is just about nearly as long, dating back to the early 1980s when I was commissioned to write the official history of the Brisbane City Council. The City of Brisbane Act 1924 was one of the great experiments in local government, analysis of which first taught me about the federalist notion of subsidiarity and how it really means little more than go ‘cap in hand’ for local government. To paraphrase Winston Churchill’s famous words at the end of the Battle of Britain, with local government it’s a case of so much being expected of so few by so many for so little. Writing “Shaping a City” I learned very quickly that those best laid intentions about local government were not accompanied by the appropriate financial mechanisms that would enable local decision makers to actually fund their plans. The vertical physical imbalance of the Australian federation and its constitutional arrangement is reflected in the Commonwealth accounting for more than 20% of GDP, the States around 5% and local government not much more than 2% – and that’s the way it has been for more than a generation. 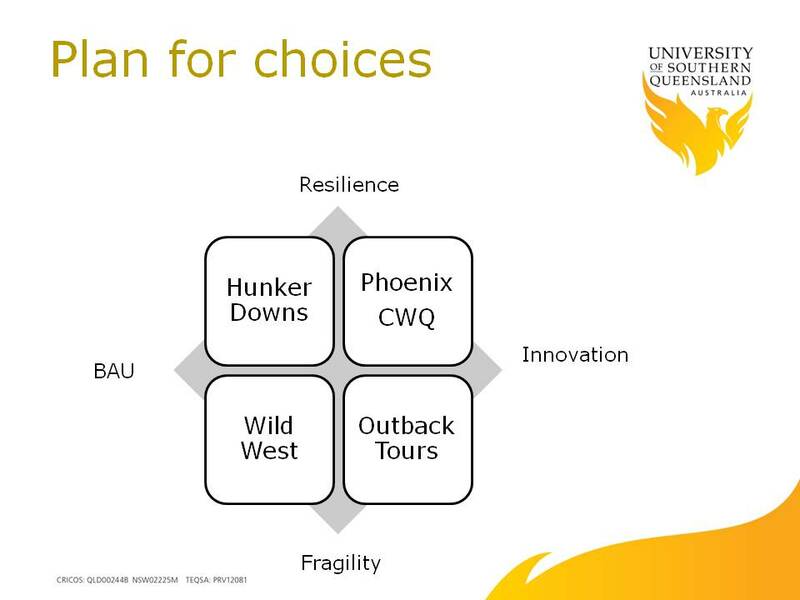 I table that right up front because in talking about ‘country Queensland’ I’m going to put out a few propositions to make a case for invigorated emphasis on resilience and self-reliance particularly. Indeed in The Australian newspaper this morning you will see an article which features LGAQ and Winton’s initiative in setting up its own renewable energy scheme – a move I endorse 100% because distributed generation for local communities means energy dollars stay in the communities with all the multipliers that means. My essential message here today is that failing the creation of new states better reflecting our regional character nationally, people living in regional Queensland must better set their own horizons for their communities and local economies. We will not draw useful inspiration or realistic plans by comparing ourselves to the major metropolitan centres. 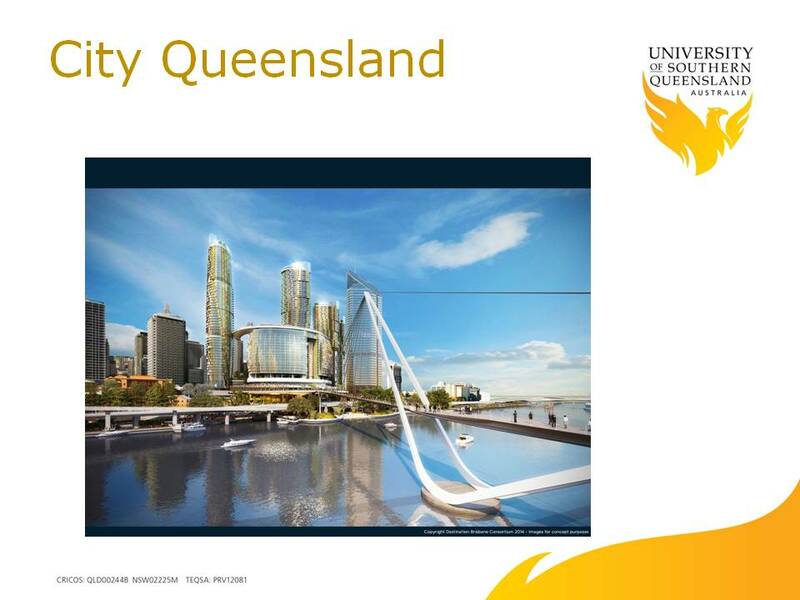 Thinking of infrastructure investment, for example, one of largest and most important major developments in Queensland in the next couple of years will be the building of five major hotels and a casino in the middle of Brisbane at a cost of around $3 billion. It’s an urban thing of state significance but I don’t know that it’s too relevant to discussing regional development issues in rural and remote areas over the coming decade. 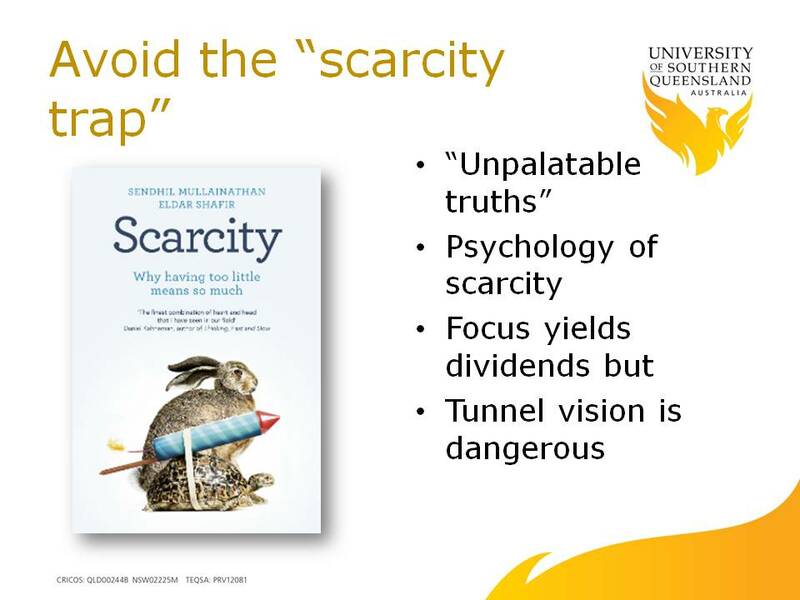 Now in this presentation I’ve been asked to talk about the future specifically the next ten years, acknowledging right up front that there’s no such thing as certainty beyond the moment. When talking about future economic, financial and technological matters we humans tend to get it horribly wrong by heeding what British philosopher Alfred North Whitehead called the “misplaced concreteness” of so called experts. The emergence of ISIS, shale oil and the global financial crisis provide recent confirmation that the main events in history are not seen coming by most people, including leaders and specialists. This point was brought home to me by Mayor Donna Stewart last evening when discussing the floods of 2012 here in St George. 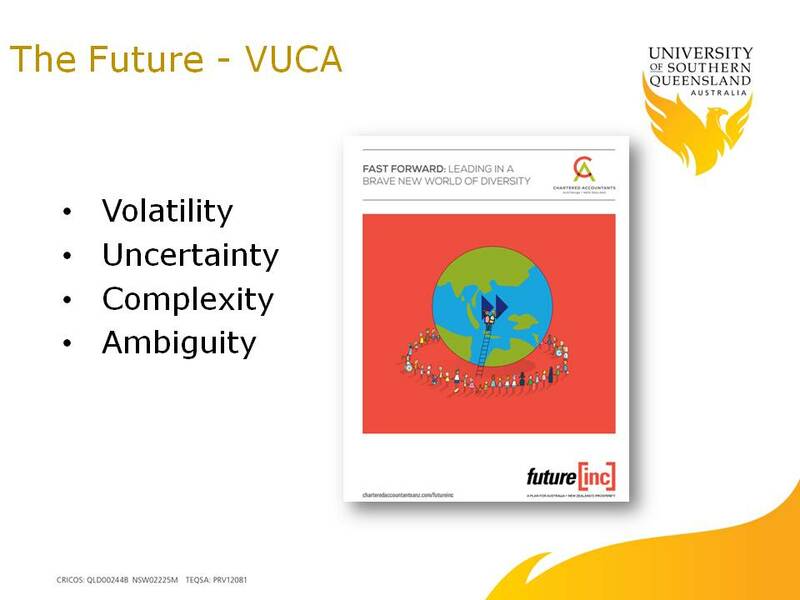 The future in fact is not certain; it’s as Deloitte’s remind us with the acronym VUCA – Volatility, Uncertainty, Complexity, Ambiguity. As regional leaders you’ve got to remind yourselves that that’s what you’re dealing with and indeed disruption whether it be a natural disaster, political intervention or technological invention demands resilience in our social and economic systems. At the moment we’re having a discussion about taxis in Queensland and particularly in Brisbane with UBER coming in and potentially eroding the value of a regulated taxi industry. Now the government will try to protect the Taxi Council and the taxi owners, but I’m suggesting to you as community leaders that your laws cannot stop the future. You cannot ban or technically disable the future simply to protect an established interest based on redundant policies and technologies. So when considering the future, what we don’t know is the most important thing, because we only think on the basis of what we know and the challenge is to think new things. So with those disclaimers this is my best estimation of the kind of things that are going to shape life here in regional Queensland over the next 10 years. 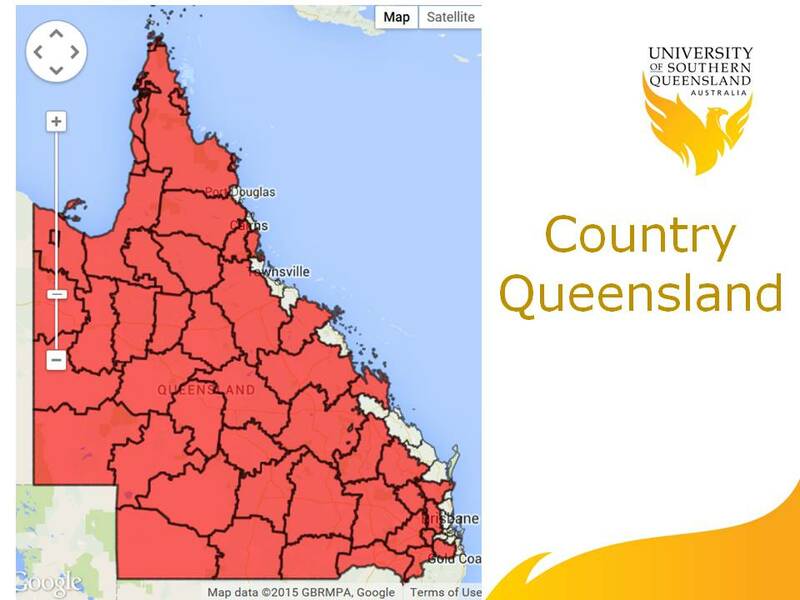 For the purposes of this presentation I’ve divided Queensland into two regions: country Queensland which is all the red in the map above and coastal Queensland which includes the major provincial centres, as well as the Sunshine Coast, the Gold Coast and Brisbane. The Queensland I’m talking about today is in the red area and it does include the indigenous councils of Far North Queensland, as well as right out west and of course the major inland mining and agricultural regions. 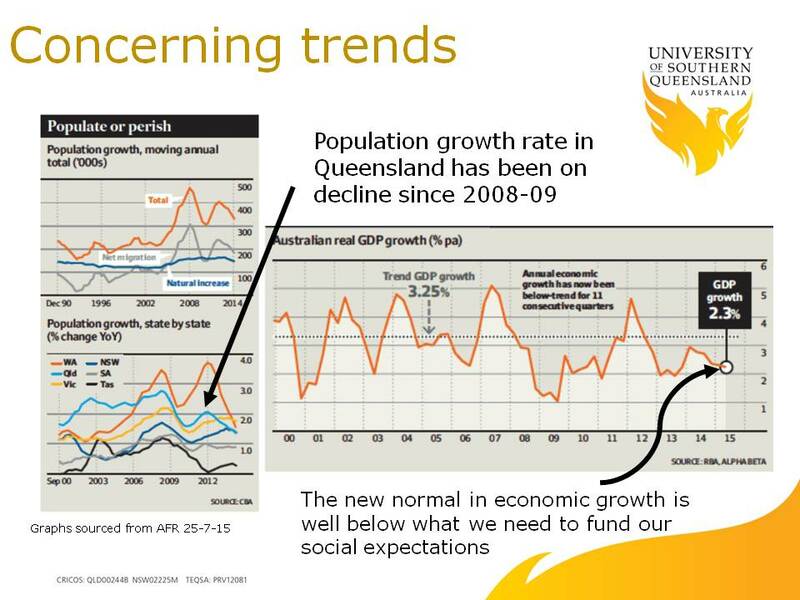 For more than a decade now Queensland has not been the growth dynamo it was between 1970 and 2005. From a high of near 3% annual population growth in 2008 Queensland’s growth rate in population has fallen behind that of NSW, Victoria and Western Australia to be around 1.5% today. In regional areas the trend is even bleaker. 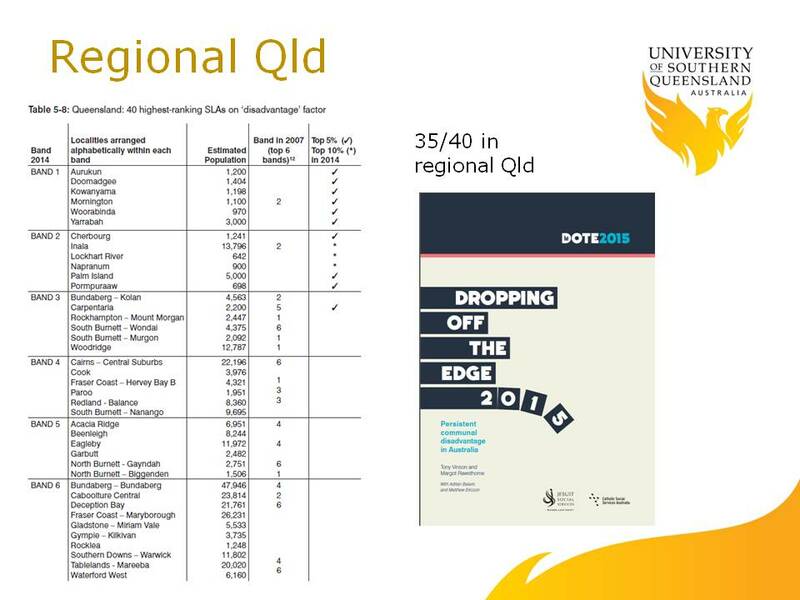 In fact by most socio-economic performance indices regional Queensland has its own unique challenges and as the recent “Dropping off the Edge” report by the Jesuits reminds us, of the 40 most disadvantaged communities in Queensland, 35 are in regional areas, many of them remote indigenous settlements. It follows that we have to be realistic about some of the challenges that we face here in looking at the next 10 years, because in many respects, to use a sporting analogy, we are starting “behind the eight ball”. 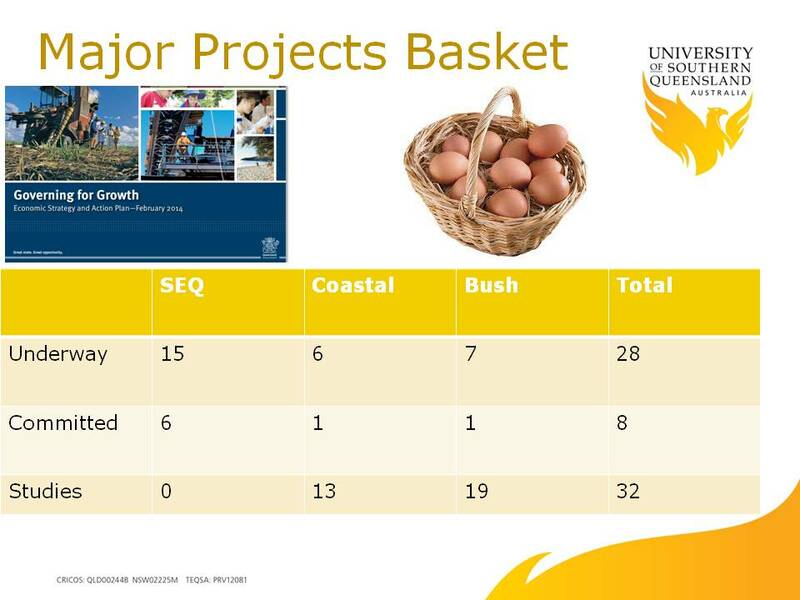 An elementary comparison between country Queensland and its counterparts in the coastal centres and metropolitan south east (using Queensland Treasury figures and projections out to 2035) paints a picture of regional inland Queensland lagging poorly. Expected inland population growth out to 2035 at 1.3% per annum will be less than the 2% annual growth on the coast. And while population churn at just over 40% is about the same as in the cities, when people move address in country areas they often leave the district taking with them sorely needed experience, expertise and buying power. The most recent census statistics (2011) suggest mobility is impacting on the regional social fabric and economic capacity much more than it might in a city of two million people. An ageing population is a national phenomenon with pending implications for everything from tax to employment to welfare and health care. But in regional areas the age divide is becoming even wider with young people leaving for jobs in the city and tree changer retirees making their way inland to live off their retirement nest eggs, with a view to spending little and producing even less. Limited expectations about opportunities for advancement are reflected in poorer education outcomes inland with just 44% of country Queensland children completing Year 11/12 compared to 58% in coastal Queensland. Compounding life course disadvantage starting with secondary school completion rates is reflected later in an almost 20% income differential with the average $65,000 household income in country areas falling $12,000 a year short of the average in the coastal and urban centres. This disparity is likely to get even wider in future because a recent CEDA report suggests of the two million jobs that will be created in Australia over the next 10 years, 75% of them will require a post-secondary qualification. What does this mean for regional areas already falling short on school completions? 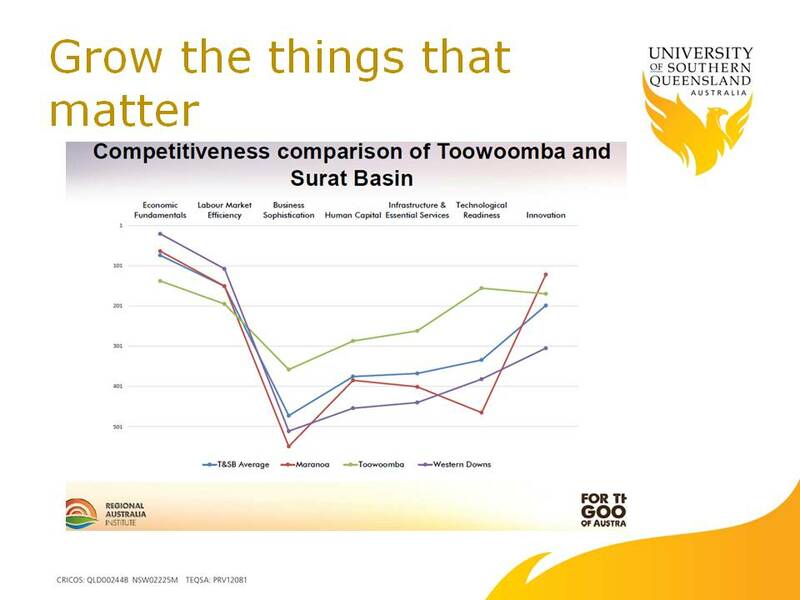 Given all these factors, not surprisingly disadvantage clusters in the remote and regional communities with 32% of the population there falling in the most disadvantaged quintile (vs 17% for the cities) – and that’s even accounting for the upward boost from mining incomes in regions like Isaacs or Central Highlands that pushes up average country family incomes. For many remote communities going forward actually means catching up to where others have already been. Climate change is a crucial issue for country Queensland because it will remain highly relevant to planning and managing regional infrastructure and investment in industries like agriculture.. In fact for the next 100 years a warming and drying climate is likely to be the determinative factor in shaping the regional economies of Queensland – and that’s only if we avoid dangerous climate change which would be more than 2°C. Australia is one of the most vulnerable countries when it comes to the negative impacts of climate change, namely warming, drought and severe weather. The global response to climate change which will inevitably yield ever escalating measures to achieve decarbonisation of the international economy has fundamental implications for Queensland as we become even more critically dependent on exports of fossil fuels. This becomes a key question of course when we look at the resources sector and the issues that they are dealing with – are market downturns and falling prices short term cyclical events or longer term structural adjustments? 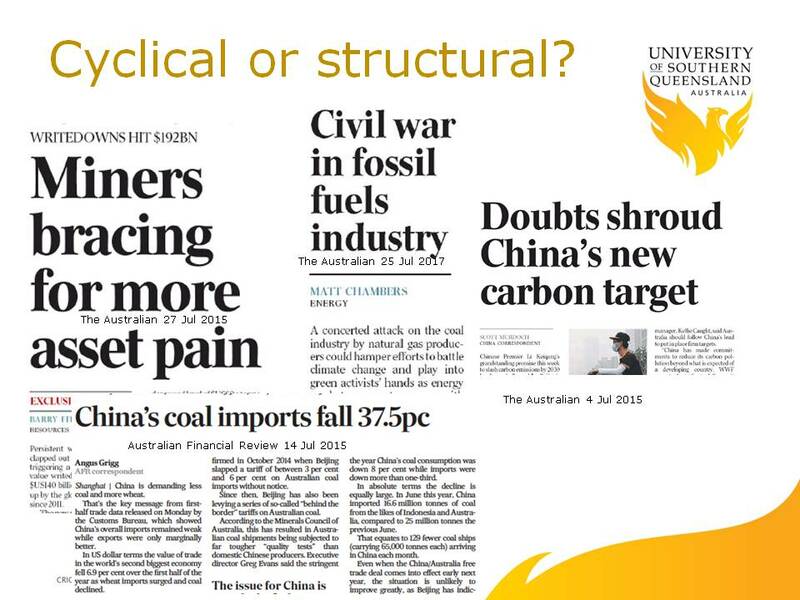 Mining communities have dealt with commodity cycles previously, but if the structural changes in key markets like China (where coal imports have fallen by 37% this year) flow through to lower demand for Queensland coal this will impact very negatively on our major mining districts, especially those mines exporting thermal coal. Major Asian markets are beginning to decarbonise their economies with the resources intensity of Japan and Korea and China already falling, a trend that will only magnify as they mature to more advanced services economies. Decarbonisation will be assisted by disruptive energy innovations which are not very far away and as an example some bush councils are already moving to end their dependency on grid supplied electricity. Energy innovation is emerging in new technologies like batteries and solar energy and distributed energy systems that allow people to be energy self-sufficient as well as reducing their carbon footprints. Crucially, if disruptive energy innovation is possible in regional Queensland it will also be happening in key export markets for our coal and gas. What does that mean for future export income? The growth of the Asian middle class to nearly 3 billion by 2030 is presented as the great marketing opportunity of our time, especially for our resources and food and fibre industries. It does presume, however, continuing peaceful development in the Asia Pacific region, unending high rates of economic growth in developing countries, and evolutionary internal social and political stability in China – and about these there is no certainty. Compared to the past quarter century which has witnessed a relatively stable geo-political regime internationally, the rise of China and the re-emergence of a antagonistic anti-western Russia matched with political gridlock in Washington and a regulatory-mad Euro-bureaucracy in Brussels virtually ensures that the next few decades are not likely to be as anywhere near as stable – with consequent impacts on a trade exposed Australia and its economy. A basic question for Queensland and its regions is: How do we diversify our economies to be not so dependent on just two core commodities. 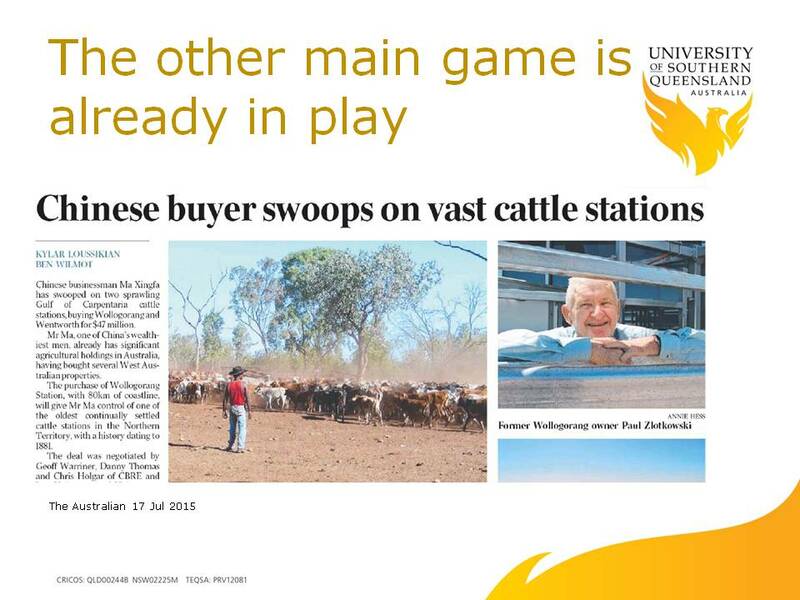 The softening of economic growth in Asia is already dampening investment here in regional Queensland. If, for example, you look at the ‘Governing for Growth’ report which then Deputy Premier Jeff Seeney released last year, you will find that most of Queensland’s mega projects like coal seam gas and LNG are already well underway and indeed of the projects that might be developed in regional Queensland some like the Galilee Basin are the subject of controversy or are little more than a figment of someone’s imagination. All of this is a reminder here in regional Queensland of just how our current development pathway is so critically dependant on what happens in China and the other major north Asian economies, Japan and Korea. If China’s annual economic growth rate weakens to 4%, leading economists Deloitte Access Economics warn that Australia will have a “fiscal fiasco” and the economic recession we have avoided now for a generation. Just this week we are witnessing the financial markets responding somewhat skittishly to the Chinese Government’s attempts to bolster confidence in the Shanghai share market. I suggest in fact that as we go forward and attempt to lessen our dependence on just one market and a narrow spectrum of commodities, one of our greatest challenges will be what Mayor Stewart this morning referred to as achieving “economic diversification” in our regions. All communities should be thinking about what could be the other eggs in their local economic basket besides the traditional reliance on agriculture and energy resources. How can jobs be created that see people actually live in the regions where they are employed? While mining has a major impact on the regional economy across Queensland in terms of its value, as far as actual local resident employment goes its very small – 6.8% in country Queensland and 1.7% in coastal Queensland. Fly- in-Fly-Out or Drive-In-Drive-Out workforces do not build the cooperative regional communities that have the social and economic capital to collaborate and innovate – that’s the Catch 22 of the current resources development model – companies before communities. It’s a model that has to be changed in favour of resources development that results in regional employment and resident communities. Innovation in our primary industries for a growing number of people means sharper focus on the value chain. As the recent Australian Government White Paper on Agricultural Competitiveness suggests it means especially re-visiting the home base of farmer organisation, exploring new ways of moving beyond bank debt reliance to building equity based family-owned farms in partnership with investors increasingly from overseas. Indeed again like local government and regional communities generally, farming that is not already large scale agri-business will have to become more cooperative to survive. Yesterday I met with Brett Kelly, the CEO of Norco the dairy cooperative in northern New South Wales that is recording record profits and is paying its farmer members eight cents more at the farm gate per litre than what is being paid to other farmers by the so called rational economic model offered by Coles and Woolworths. Norco has lessons relevant to Australian farmers and my Institute looks forward to working with industry bodies and research organisations like RIRDC to help farmers re-build they cooperative capacity they need to be competitive. . The other big issue doing the rounds in the debate about regional Australia’s future is the topic of foreign investment and its supposedly threatening role in corporatizing rural industries, especially agriculture. Regrettably, the debate about foreign investment is being presented as being a threat to the family farm – which makes up about 98% of the primary sector – when really it could well be the lifeline that assures thousands of Australian farming families of continued ownership of their property. In a globalised economy we have to look back down the track back behind the farm gate to the farm itself and the debt-leveraged business model that arguably has resulted in many primary producers getting into financial strife, especially in marginal farming regions. To play competitively in the world of global markets and mobile capital, I believe family farmers should be building their capacity and competitiveness by better organising themselves, sharing information and resources, working together to form investment vehicles attractive to the patient capital offered by international pension funds and investors. 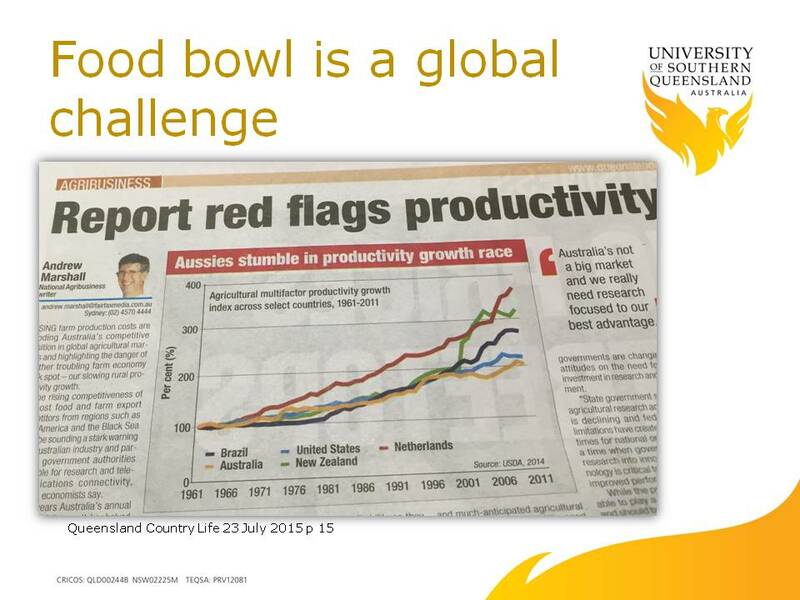 USDA figures on agricultural multifactor productivity growth over the past 50 years saw Australia pretty much in a neck and neck race with countries like the US, Brazil and New Zealand – only to be left well and truly behind by all three over the past 20 years. A resilient more productive farming sector requires a more patient capital model, one that is based on equity not on bank debt. Our competitors are out there doing just as good if not better and indeed the need for research and innovation does not escape agriculture. We see it here today here in the Balonne catchment – one of the more innovative districts for Australian and Queensland agriculture that demonstrates how investment, infrastructure and innovation can help a regional economy deal with the cycles of climate and commodity markets. 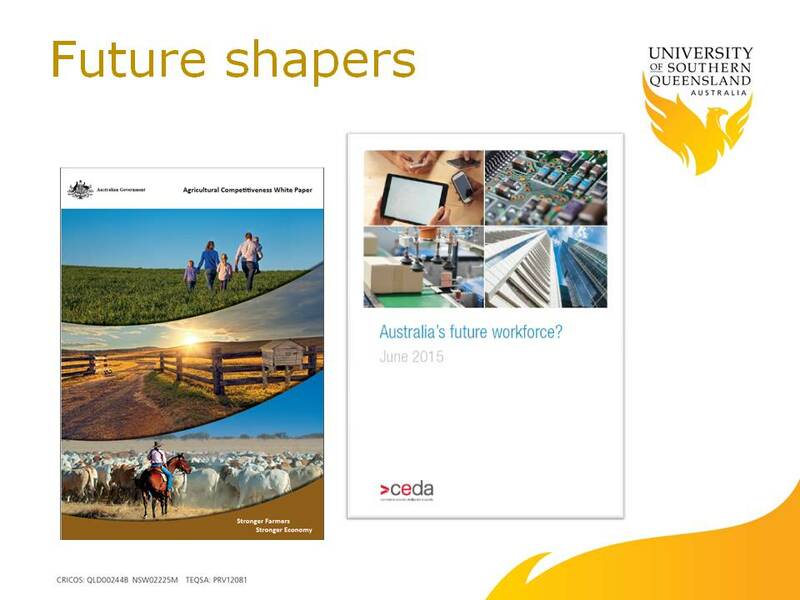 We are already living in the digital world and policy think tanks like CEDA are saying that we are on the “cusp of a technological revolution”, but here in regional Queensland we are not very well-equipped to be part of the transformation – and it’s a key shortcoming that government has to fix! The digital infrastructure on which everyone is increasingly dependent is a lagging performer in regional districts, with just 70% of country households connected to the internet versus over 80% in the cities. Internet connectivity is a prerequisite for the digital economy but, as I was reminded coming out from Dalby yesterday, for much of regional Queensland there is not even adequate mobile phone coverage. I read the other day that enough data is generated each day to fill 340 newspapers for all 7 billion people living on Earth – and yet regional businesses inland find their internet connection chokes as soon as there is any local demand – with resultant inefficiencies and costs. Like any economy looking to the future, the regional Queensland economy needs the cloud services, big data insights and opportunities, and innovative communications shaping the global marketplace. 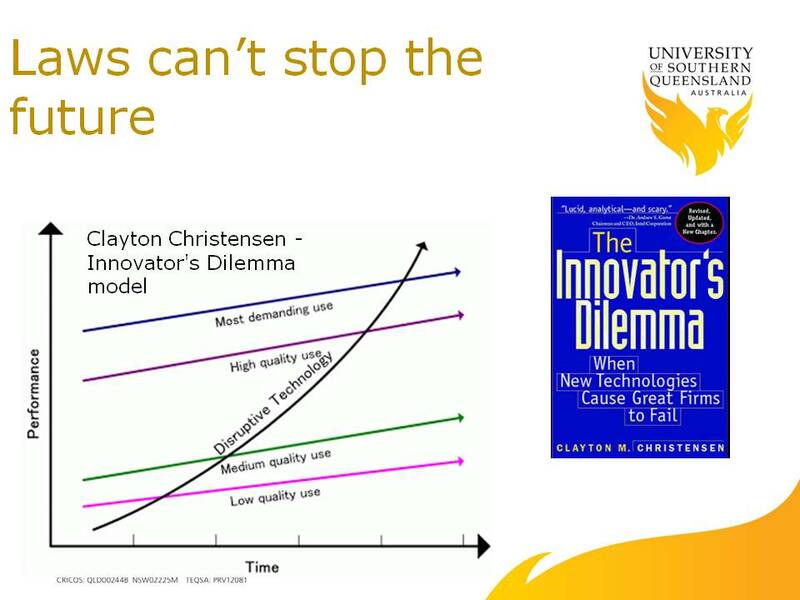 And within the individual enterprise digital innovation presages much wider consequences for the way we work – including here in regional Queensland. Digital literacy and the rise of the digital economy will be a core theme either positive or negative to the future of regional Queensland. Of the two million jobs to be created nationally over the coming decade, many will derive from the digital economy. Perhaps more pertinently, a recent CEDA report on the future of work suggested that upwards of 40% of jobs in the next 15-20 years in fact could be made redundant by automation and IT innovation. 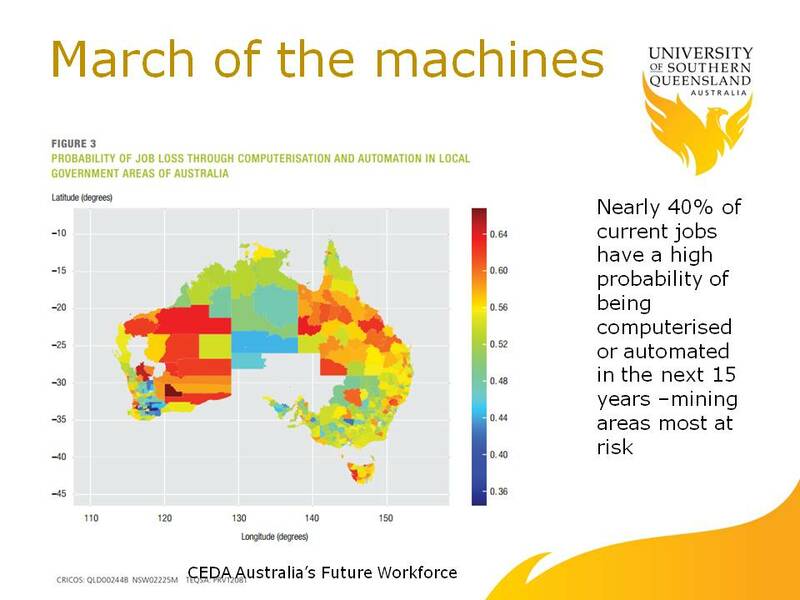 So these things should be really front of mind when you start planning the future for regional Queensland because these major trends will impact locally with the impacts of automation being felt most likely in mining communities. 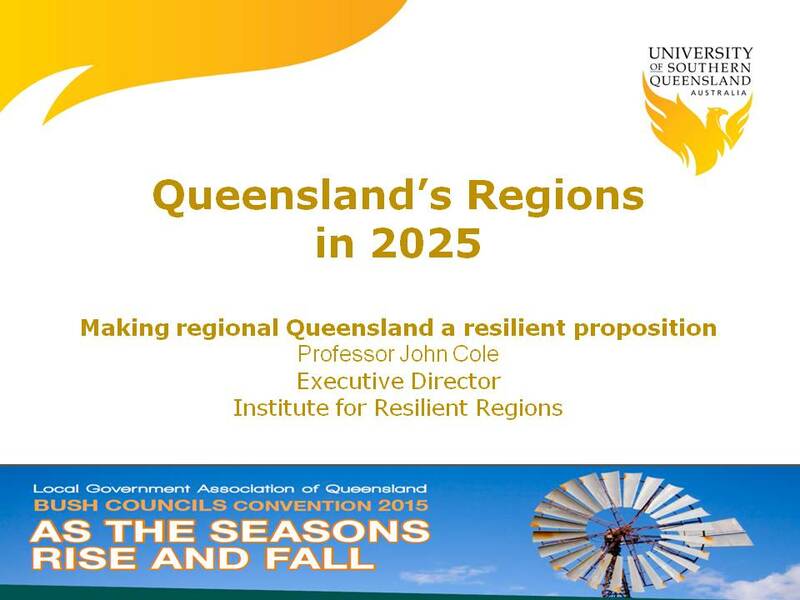 Over the coming decade underscoring all these themes in shaping regional Queensland will be the fiscal constraints of Federal and State Governments that without major reform to our federation and taxation systems are likely only to see a further diminishing role for government. More basically though we have to improve our productivity because the national economic growth rate is well below where we need it to be to afford the standard of living expected by most Australians. In other words there’s a reason for fiscal deficits by government and the politics of deficit management will prevent major government investments in infrastructure and new industries that might be on the wish-list of regional Australia. Our so-called ‘entitled’ expectations of government are not matched by our willingness to pay taxes or our willingness to see government reformed. Rather predictably given our city-centric polity, there is no mention of regions on the priority list of the political class. At both the federal and state levels a key challenge and inherent weakness with policy is that one size doe not generally fits all because the reality of Australia is that it is a nation of regions and sub-regions. So I suggest to you that we’re at a point looking at the coming 10 years where to achieve resilient regional development Stafford Beers aphorism is apt: “acceptable ideas are competent no more and competent ideas are not yet acceptable”. Some of the things I suggest that need to be done involve local government – but as community leaders you can also lead the broader conversation, animating it and generating awareness about things that will enable resilience in your part of the world. 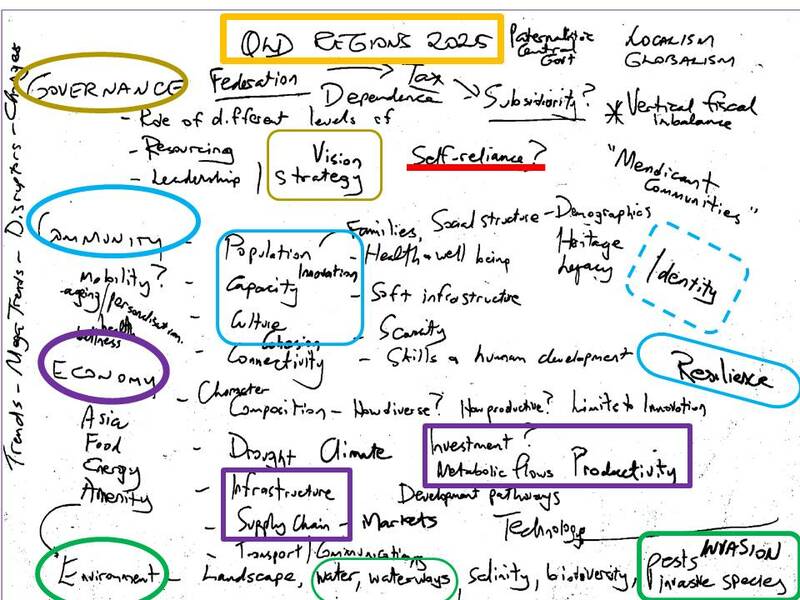 How do we become more self-reliant in our local regional development? How do we do more without looking to Brisbane or Canberra to do it for us or provide the funding? How do we develop ideas by ourselves, pool resources, cooperate between sectors and attract partners and investment? How do we rebuild a culture that 100 years ago framed the approach of our forebears in building communities, economies and industries using vehicles like local cooperatives? These are the kind of questions that all local communities and their leaders should be asking themselves and the vision needs to be longer term. Every community must have options. As leaders your priority should be the business of building options for your communities because without options the future inevitably ends at a brick wall or a cliff. When we talk about resilience we are not talking necessarily about levee banks, flood mitigation schemes, or fire fighting systems – important as all these are. We are really talking about the capacity of a system – natural, social or economic – to maintain its core purpose and integrity. With human resilience we’re talking about state of mind; we’re talking about creativity, aptitude and attitude. 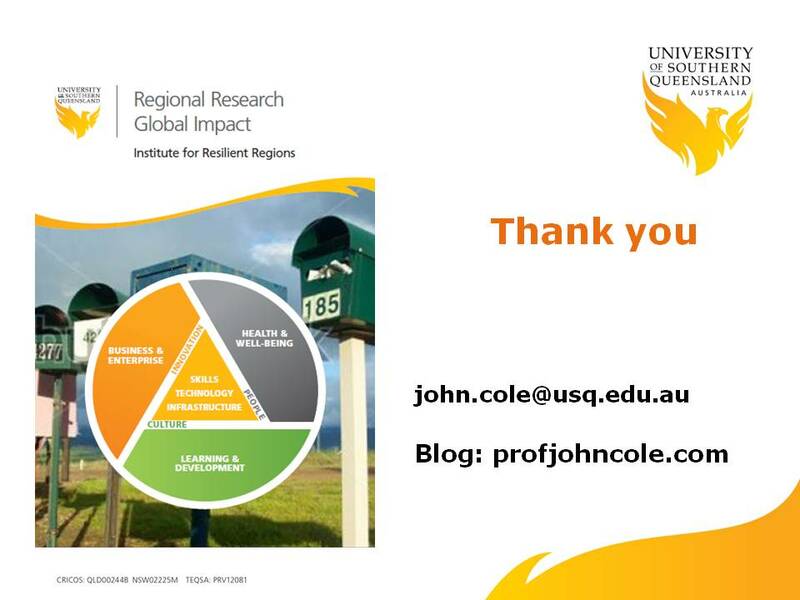 Regional resilience encompasses those processes and functions that not only enable communities to bounce back but to bounce forward into the future, to keep going, stay relevant and be competitive. 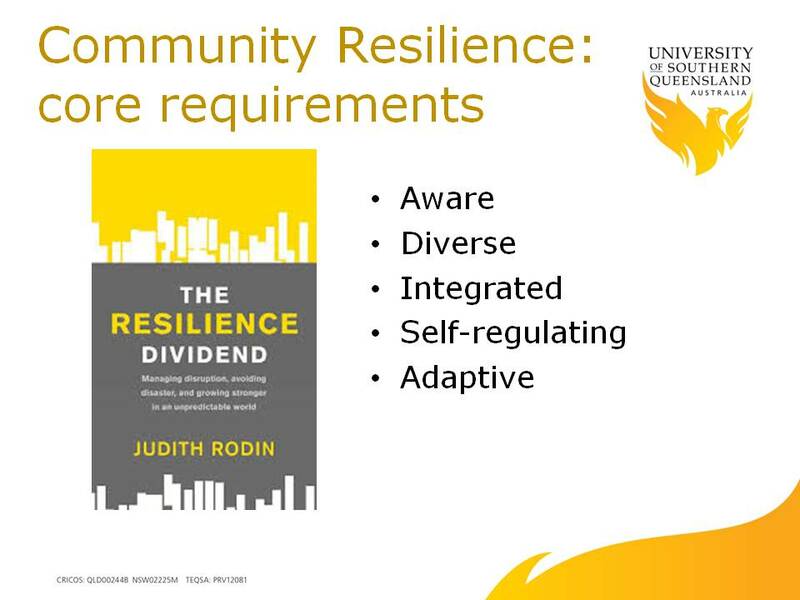 Indeed for all that to happen as Judith Rodin from the Rockefeller Foundation has pointed out in her book The Resilience Dividend, communities have to be aware of the issues and the factors shaping their progress. She also suggests that the most resilient communities are grounded in diversity – natural, social and economic diversity. Beyond these foundations, your communities should be doing everything you can to work together and build partnerships with the outside world which is why the digital stuff is so important. Resilient communities self-regulate and make decisions for themselves and look for funding alternatives different to going cap in hand to the next level of government who then pass the request up the chain all the way to Canberra. In a federal structure which does its best to marginalise regional communities, the cap in hand strategy is neither empowering nor yielding of dividends. Most fundamentally we need to be adaptive. The adaptive cycle which is well known in natural systems also applies to communities, regions and economies. 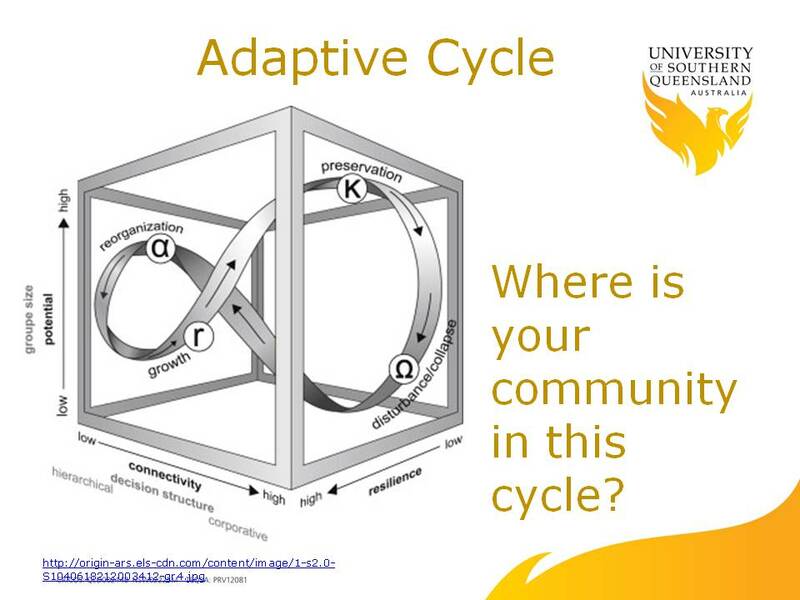 Ask yourselves where on the adaptive cycle is your region? How do you reorganise so you grow again? How do you preserve the essential heritage and capacity of your region without finding yourselves in the trenches and being overrun by drought or disruptive innovation or the megatrends of change? 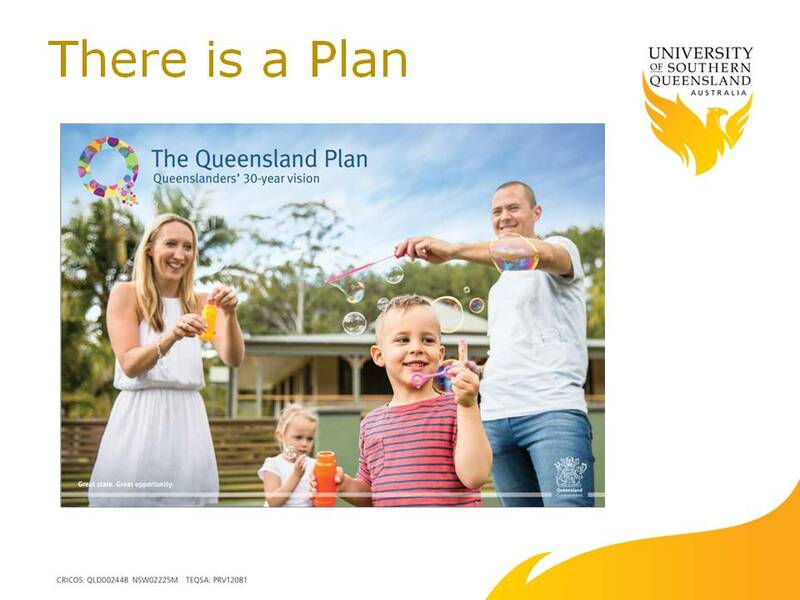 In that vein one of the positive things that the Newman State Government did was facilitate the creation of the 30 year Queensland Plan with an input from 78,000 Queenslanders. Even though we have had a change of State Government, the vision, goals and many of the key strategies of the Queensland Plan remain relevant and should transcends partisan politics. 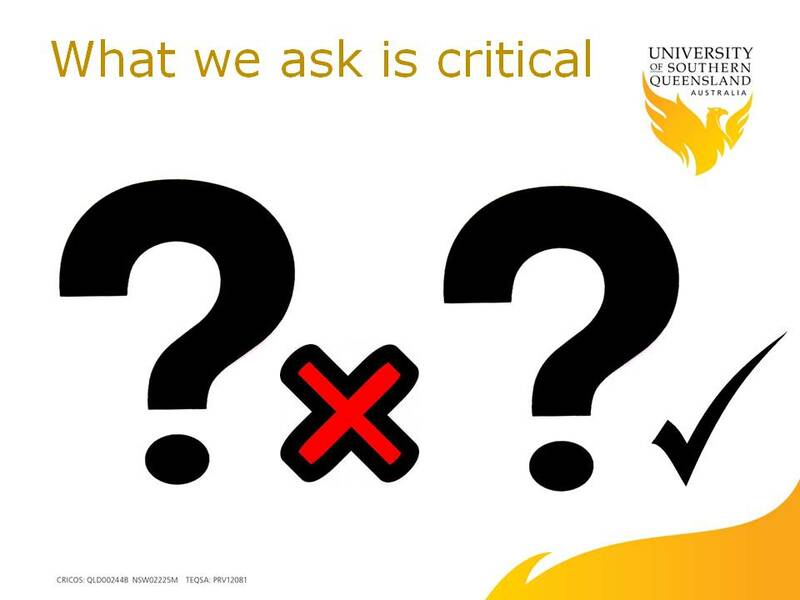 The only reflection I attach to the Queensland Plan is to wonder whether we got all the questions right during its formulation because in setting a course for the future the questions we ask are so critical, particularly if such plans are amount to more than wish lists or political brochures. I suggest to you as local government you have spent too long looking in the wrong place for the answers along the way asking some wrong questions like seeking constitutional recognition. 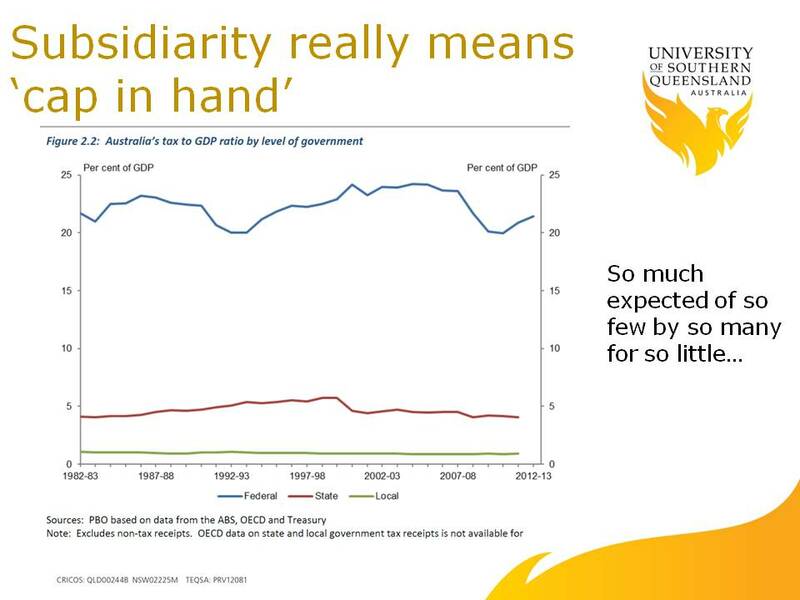 The government gravity in Australia is highly centralised. 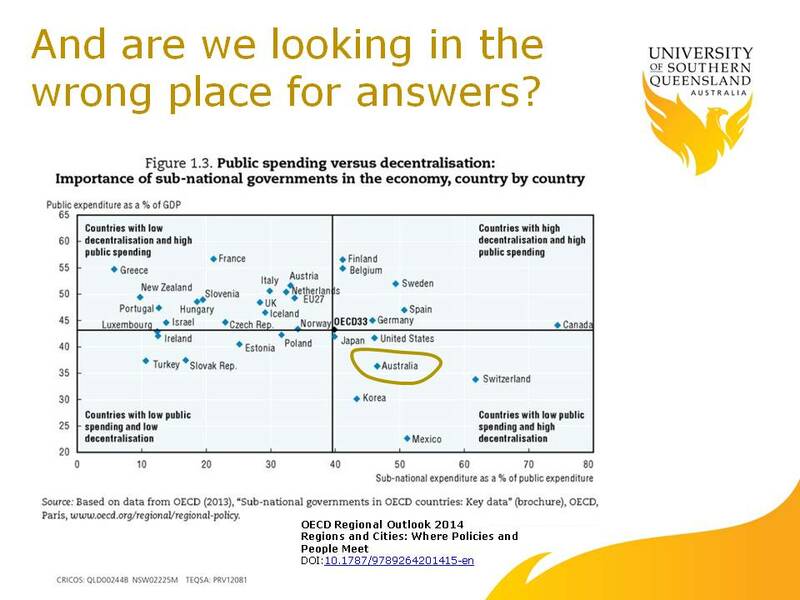 Among the OECD first world economies, Australia stands out as a relatively decentralised country with one of the lowest levels of expenditure by sub-national governments. The power and money is centralised but the need is de-centralised. To get beyond the Canberra drip feeder that is our current federal system, very different thinking is needed – thinking that almost takes government out of the equation. Preparing for this conference I put some thoughts down about governance, community, economy and environment and quickly moved on to resilience, self-reliance and identity before ending up at leadership. we will only build resilient self-reliant communities by generating information and awareness, including as many local people as possible in the conversation, cultivating connected cooperative cultures and striking up collaborations locally and directly with external partners drawn from other levels of government and increasingly (and more importantly) the global investment marketplace. Above all else regional communities have to build their own capacities to adapt and to innovate – and that is something that requires strongest focus on the human capital of the region and its education and training. 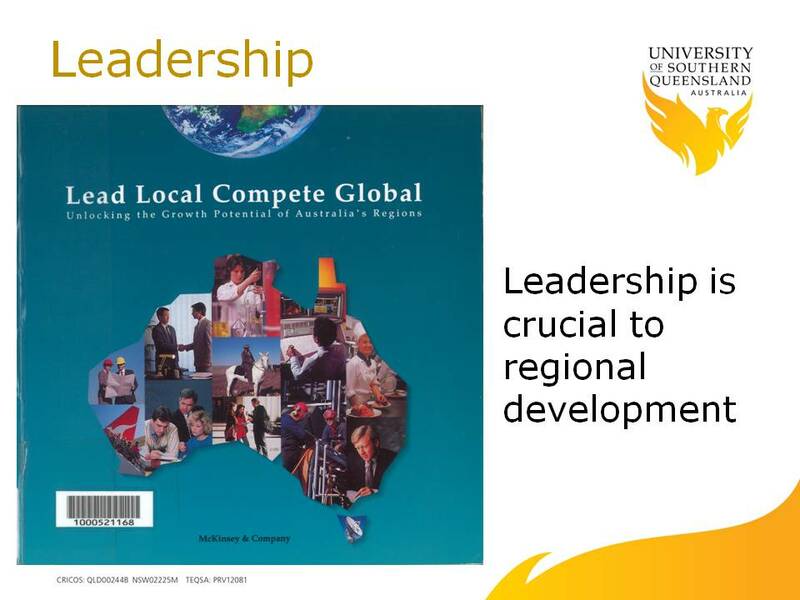 McKinsey told Paul Keating’s government 20 years ago that human capital was critical for making the most of regional development, that attention be given to skilling and education and leadership development because those factors would determine the fate of many communities. The leadership message if anything is even more relevant today. And in leading your regional communities forward amidst the day to day struggle of dealing with droughts, water allocations, wild dogs, money for road maintenance and poor digital communications – in all that don’t get caught in the trap of only focussing on what you know and what you think you’re best at, because such tunnel vision is likely to see your community lose out. Tight focus trying to keep things of the tight pathway of preconception means you miss all those lateral opportunities being created by the world changing around you. And while the infrastructure and government funding for it remains important, remember government cannot build your future for you. Give as much thought and emphasis to strengthening your local culture and how you people learn and understand and deal with change. Work by the Regional Australia Institute has highlighted the crucial importance of business sophistication, human capital, labour market efficiency and capacity for innovation in boosting the competitiveness of regional economies. 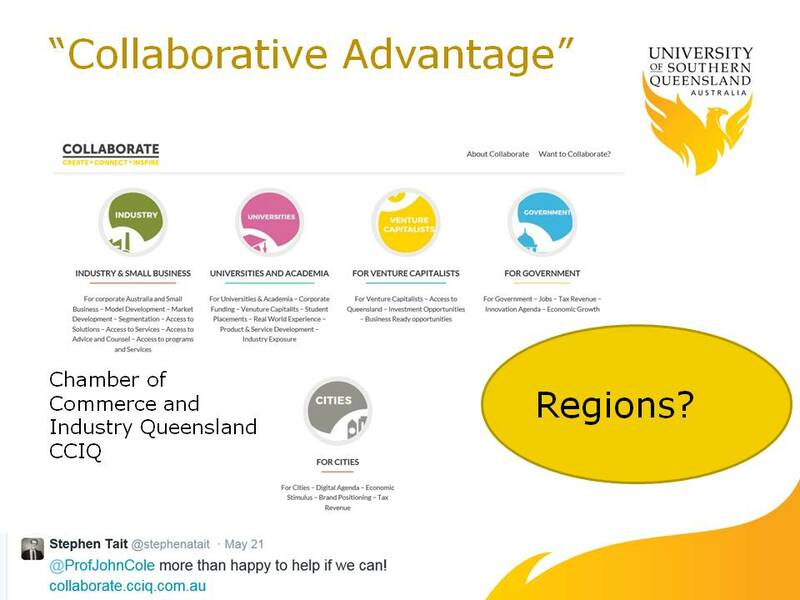 What is the leadership of your community doing to boost those attributes of competitiveness, building business networks for collaboration and investment within and beyond the region, working with local chambers and organisations like CCIQ? In a house near USQ’s Springfield campus I know of a group of young people living in a house developing digital apps for commercialisation in the global digital economy. Be aware of the entrepreneurs, the new value creators, in your community and champion those people who want to have a go. Get behind them because without entrepreneurship there are no new opportunities. All of this cultural stuff is part of the soft wiring of your community. 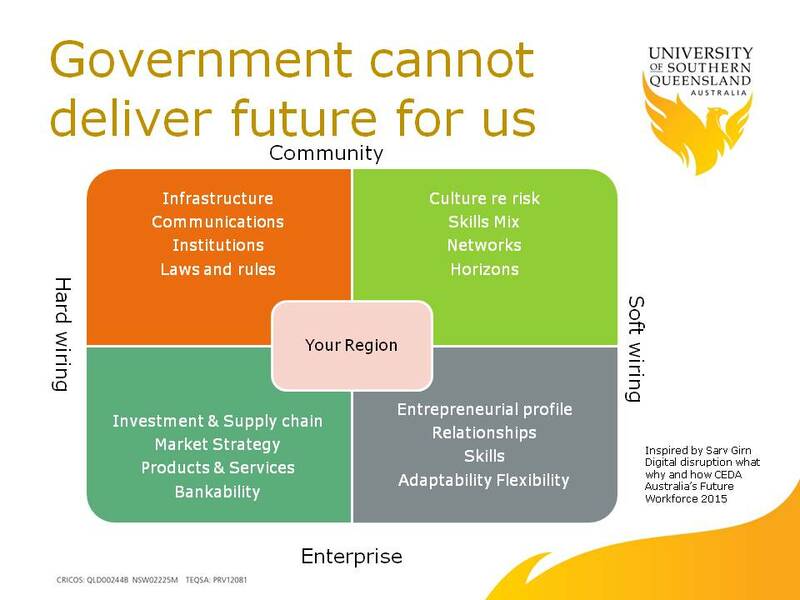 Local government spends so much time on the hard wiring infrastructure stuff and understandably so – that’s your formal remit – but the ingredients that are really going to make the future are in the realms of a region’s soft wiring. In going forward plan for choice, sketch out some scenarios – don’t just have one view of the future. Plan and play out the options – look at what might happen and throw in all the ideas – even the crazy ones – and lastly, think the unthinkable! Don’t waste your time talking about the stuff you already know. 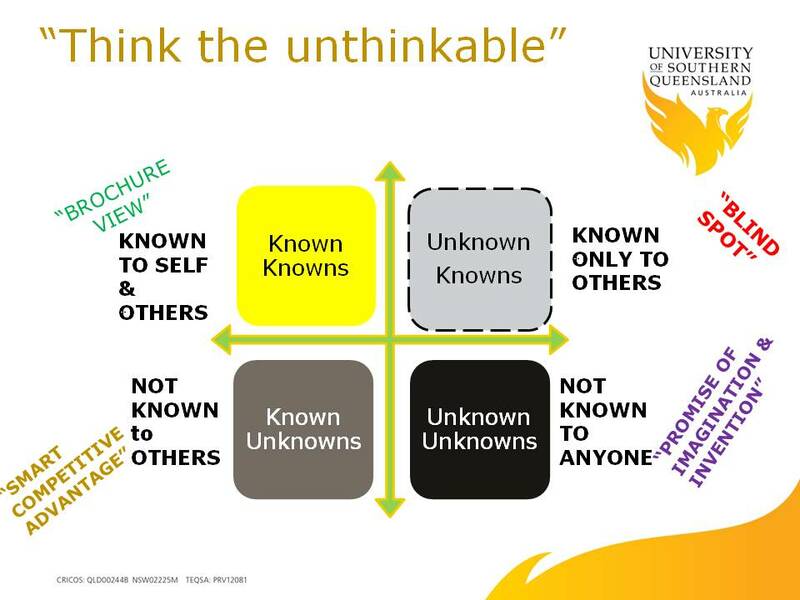 Spend more time digging out and utilising the ‘unknown resources’ already in your community but which are lost in its own blind spot. Inevitably these resources will be overlooked human and social capital – people, young and old, men and women – and sometimes they will be regional alumni, people with deep connections to your part of the world but who no longer live there. In the mini-universes of our local communities we have too the unknown unknowns of futures not yet imagined. When I visited the Remote Area Planning and Development Board up at Longreach recently Stephen Tait, the CEO of CCIQ asked me to pass on his message that private enterprise wanted to work with local government to build regional enterprise and economies. My final point is a question: Can your Council deliver ‘adaptive governance’ or government that leads and facilitates change rather than attempts to control and limit it? The conventional approach to local government has been to manage resources to deliver efficiently for stakeholders, working to fixed targets, taking little account of uncertainty, utilising essentially what could be called administrative templates – all within a specific local government culture that differs little from one Council to another. 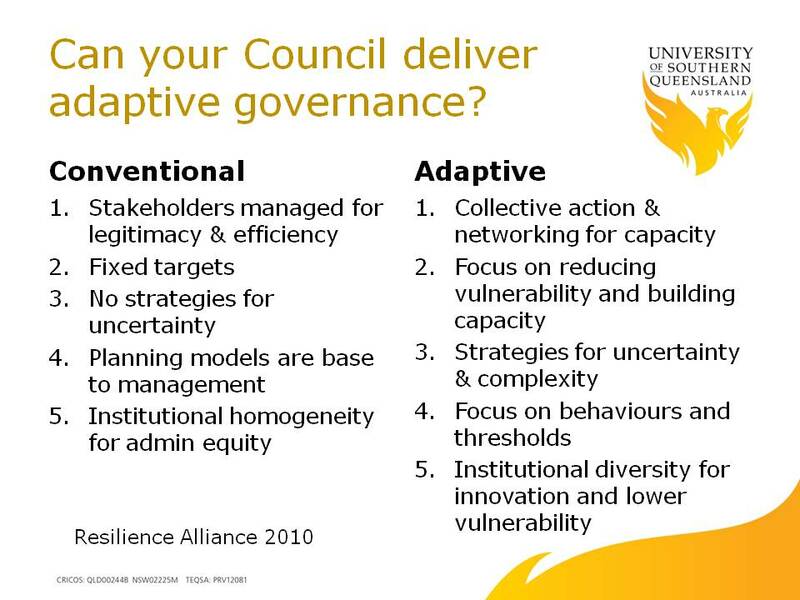 Given the magnitude and velocity of change in our world the utility of this model of governance is being superseded and over the coming decade the Bush Councils particularly are going to have adopt the ‘adaptive governance’ model to ensure local development that is sustainable. While strategically very different, adaptive governance by Councils should build on the improvisation and resourcefulness already evident in your modus because of the dictates of scarcity and necessity. Adaptive governance puts far greater emphasis on collaboration and networking to build new behaviours and capacities to promote innovation and reduce vulnerability. The transparency and flexibility of this approach means uncertainty about the future and complexity in the issues of change are addressed as realities, not put in the too hard basket, denied, or projected to another level of government. None of this diminishes the magnitude or the difficulty of the challenges faced by country Queensland. The resilience, attitude and creativity of local leaders will be tested in the years ahead. But as Winston Churchill once said “The pessimist sees difficulty in every opportunity. The optimist sees opportunity in every difficulty”. Only the optimists among us have the attitude necessary to ensure our communities sees it through the tough times, becomes more capable of setting their own horizons, and creates a opportunities that well serve future generations of regional Queenslanders. The question now is can we build the strategy to match our attitude?